The central province of Quang Tri has been luring strategic investors who have potential in capital and technology to involve in large-scale wind power projects. After putting the 30MW Huong Linh 2 wind power plant with a total investment of 1.5 trillion VND (64.3 million USD) into operation in 2017, the Tan Hoan Cau Corporation Joint Stock Company has continued to invest in the Huong Hiep 1 wind power plant in Huong Hiep commune of the mountainous district of Dakrong. The 30MW project is expected to generate 126.3 million kWh of electricity per year. Built at a cost of about 1.55 trillion VND, the plant is scheduled to be completed in late 2020. By January 2019, Quang Tri had one wind power plant put into operation, four under construction and dozens of others under survey. 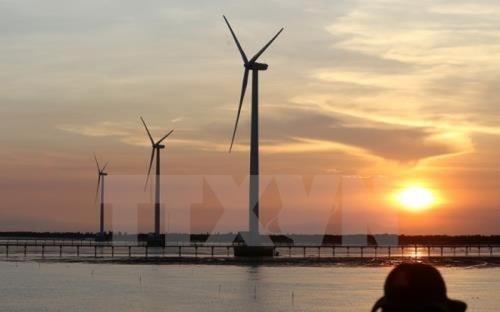 According to Nguyen Duc Chinh, Chairman of the provincial People’s Committee, four wind power projects, each with a capacity of 30 MW, will become operational in the province in the time to come. Quang Tri boasts strength in attracting wind power investment. The locality has zoned off three wind power development areas on a total of over 6,700 hectares. The first area covers 2,789ha in Huong Son, Huong Lap and Huong Phung communes of Huong Hoa district, and the second spans 2,882ha in Huong Hoa district’s Huong Linh, Huong Lap and Huong Hiep communes. Meanwhile, the third area covers 1,036ha in coastal areas of Gio Linh and Vinh Linh districts and Con Co island district. Chinh said that attracting investment in energy, including wind power, is one of the priorities of Quang Tri to turn the locality into an energy hub of the central region. To achieve this goal, the province has issued a number of policies to support businesses in terms of tax, insurance, contract and land.